Everybody’s got a name. Jonny, Teddy, Annie, Jenny. And so does the ABC. Its full name is Alphabet. Sounds odd, doesn’t it? It’s just a foreign word. Who gave the ABC such a name? Let’s see! This story happened in Greece. It was a beautiful sunny morning, and a Greek boy was having fun on the beach. 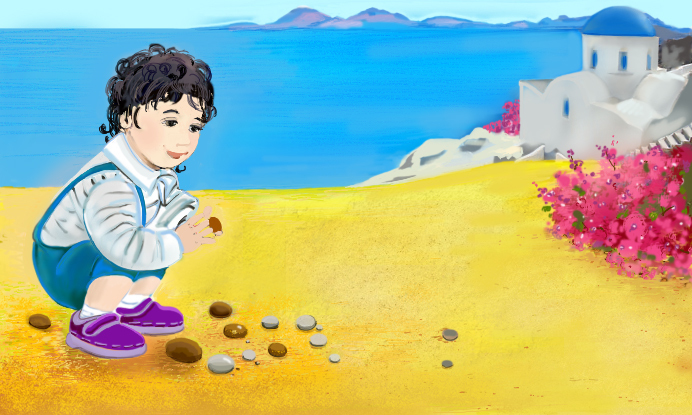 He was splashing in water and gathering colorful pebbles when suddenly he noticed something moving in the sand. He came closer and saw a bundle of colorful letters tied together. ‘What are your names?’ – asked a surprised boy. The letters were crying out their strange names.